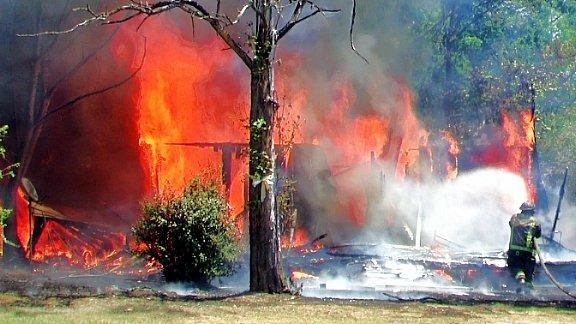 Fire Consumes House, LEGGETT, May 2, 2011 - At approximately 1:10 pm on April 29, 2011, Norbert Dugas, of Livingston, was driving and spotted a home on fire and called 911 and was put directly online with the Livingston Volunteer Fire Department. According to Dugas, he spotted the fire and went up to the house where he spotted a man leaving the house to get a water hose. Dugas stated that the fire appeared to be coming from the attic, but in a matter of 5 minutes the house was completely engulfed in flames. Firemen from Livingston arrived to find the house fully involved and immediately began hosing the fire. Additionally, Deputy Terry White and Sergeant Jason Paske (both with the Polk County Sheriff's Office) were dispatched. The home is owned by Margaret Holman and it was not insured. Nobody was injured in the fire that totaled the home. Deputy White conducted a preliminary investigation and turned it over to Polk County Fire Marshal, Jay Barbee. The fire was completely extinguished by 1:49 pm. Interview with Norbert Dugas and footage from the scene.